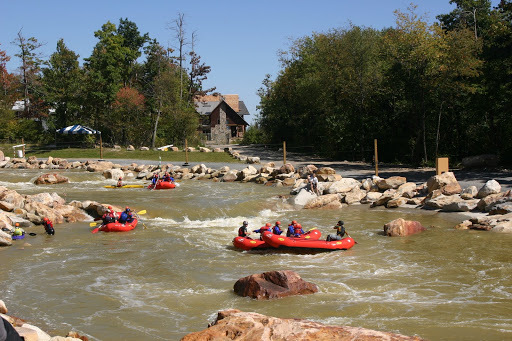 I was lucky enough to get a chance to paddle on the whitewater course at the Adventure Sports Centre in McHenry, MD. The course in located on the top of Marsh(?) Mountain and uses the same water from Deep Creek Lake as is used on the Upper Yough. The eddies in the course were super swirly and the flow in some places felt rather unnatural. This seemed to be due to the flat concrete riverbed. On a natural river, the eddies have rocks and plants in them to slow the recirculating flow. There are no such “speed bumps” on the ASCI Course. The course can release two pumps for a class II-III experience, 3 pumps for a class III experience, and 4 pumps for a class IV experience. The waveshapers could also make any surf feature more or less difficult. This was a pretty exciting spot, fun rapids, lots of friends, no take-out hikes, and super surf features. It was like spending the day at Canada’s Wonderland in your kayak!